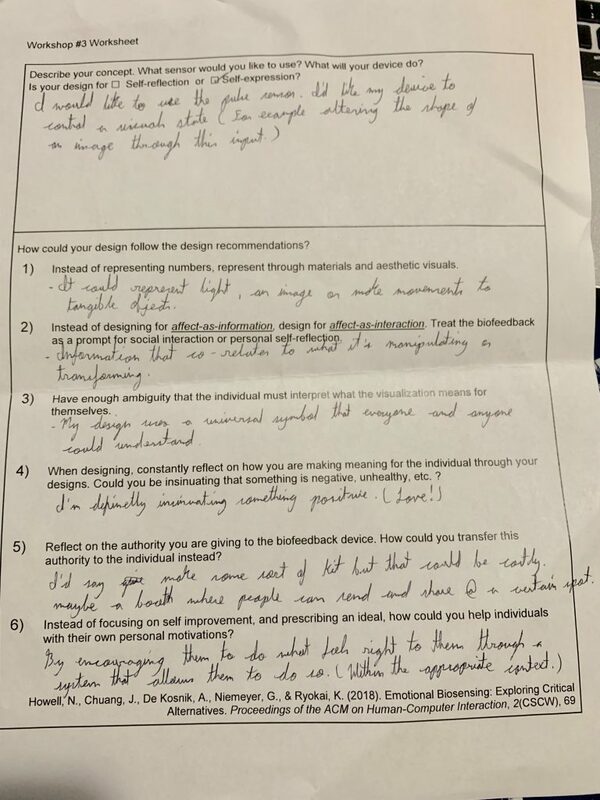 This week’s workshop looked at vibrations and other means of haptic feedback. 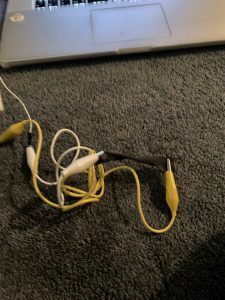 For this exercise I wanted to look into haptic vibrations specifically as alarms for quick time naps that can be felt on the body so the user can be nudged out of sleep more gently and less intrusively. Figure 1. 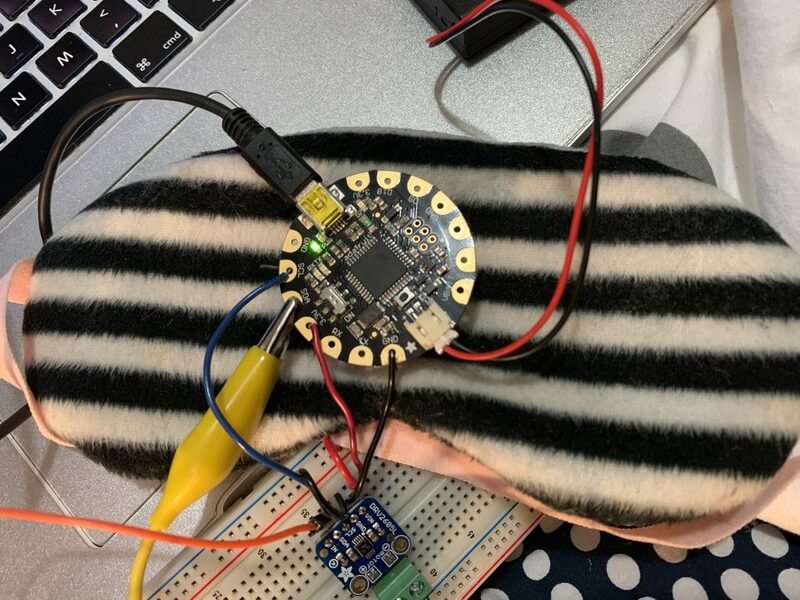 Adafruit flora with sleeping mask prototype. 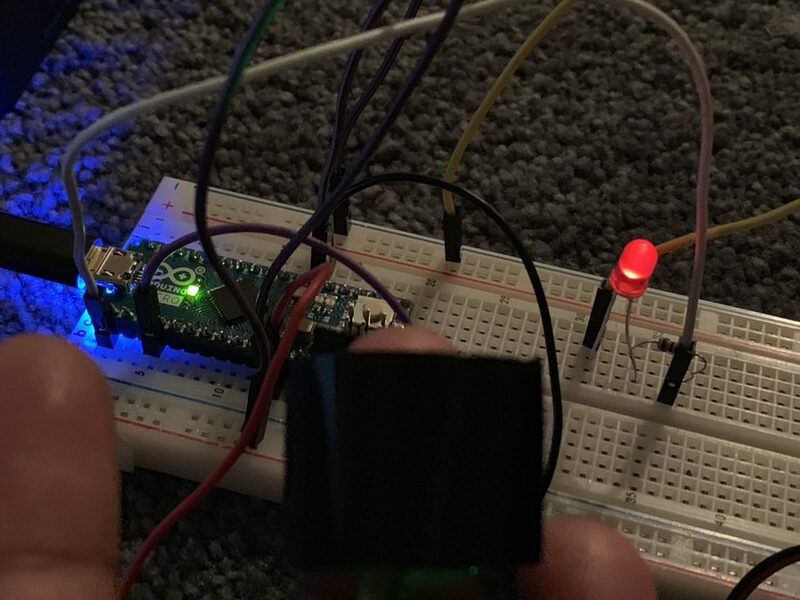 I looked into the DVR board and vibration motors online when I stumbled across this DIY tutorial by Becky Stern. She had used the board and motor to create a timely vibrating headband that would vibrate after a certain amount of time has passed. She did this to help her time her meditation sessions. Figure. 2 Haptic Headband by Becky Stern. 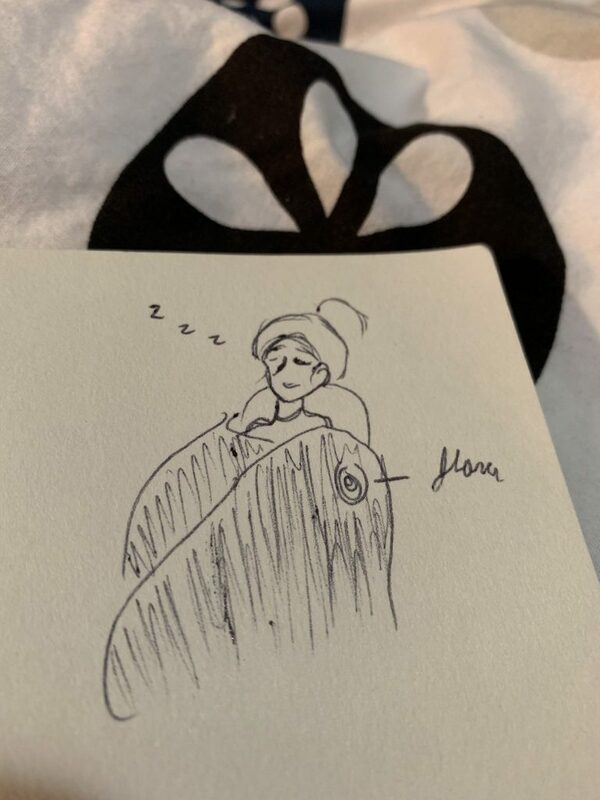 Inspired by timely vibrations and familiarizing myself with the different waveforms I started to sketch out some sleeping scenarios where I could attach a vibrating wearable device. This idea was only meant for quick time naps spanning from 10 minutes while taking a break from studying. Figure 3 and Figure 4. 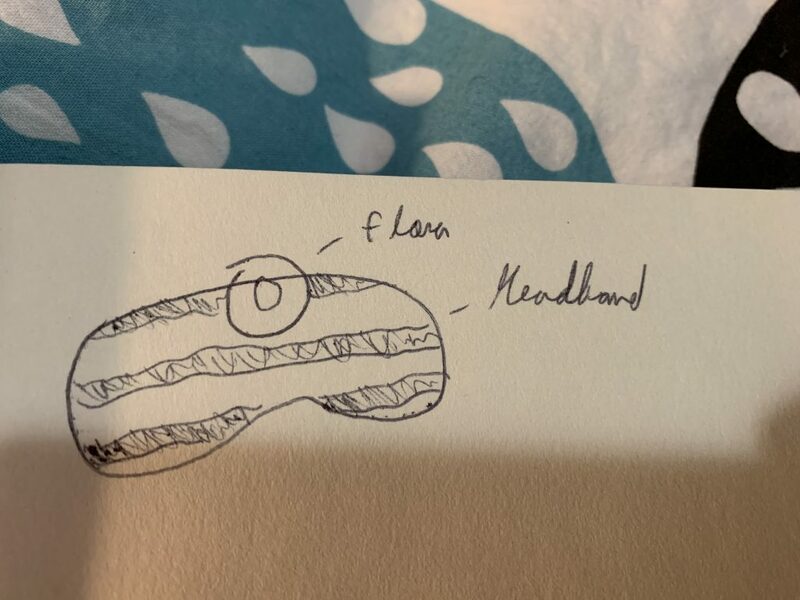 Sketches of sleep mask and blanket. First picture using a blanket wrap near the shoulder. Second picture using a headband with the flora attached on top. While spring cleaning I dug out my Adafruit Flora board that I found in my closet. 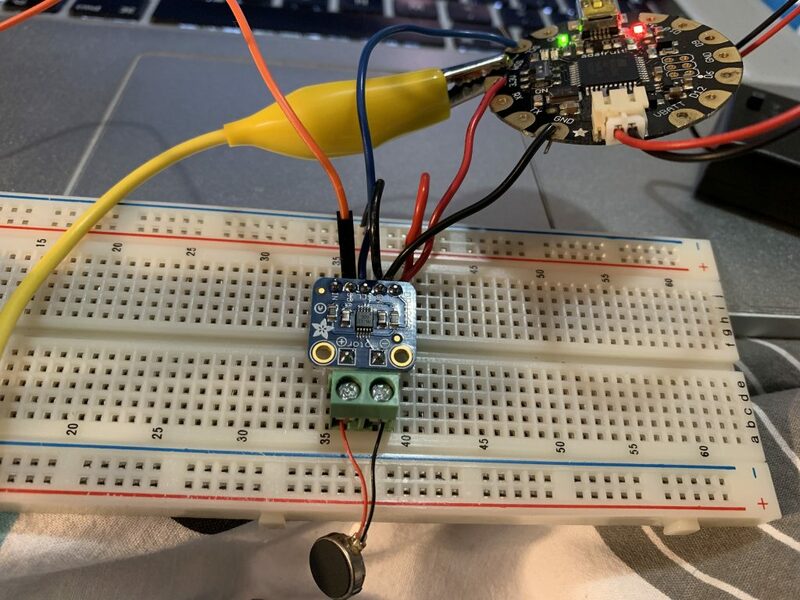 It still worked so I decided to play around with it to test out different waveforms from the Arduino IDE library that worked with the DVR board. Figure 6. Breadboard setup with the Adafruit Flora. Figure 7. Testing different vibration sensor waveforms. After going through all the waveform vibrations I really liked the waveforms of 65 – 70. They were powerful enough yet soft on the skin to be awoken to gently. I went with 65. Figure 8. Ardunio serial port. Displaying different waveforms. Figure 9. Timed flora code from Becky Stern’s DIY Haptic Headband. I adjusted the waveform number to 65 and changed the wait variable to 5. Using the example code I got from Becky’s DIY page, I adjusted the waveform interval in the code and ran it through the Flora. I set the timing for 5 seconds so the vibrating sensor would go off every 5 seconds. 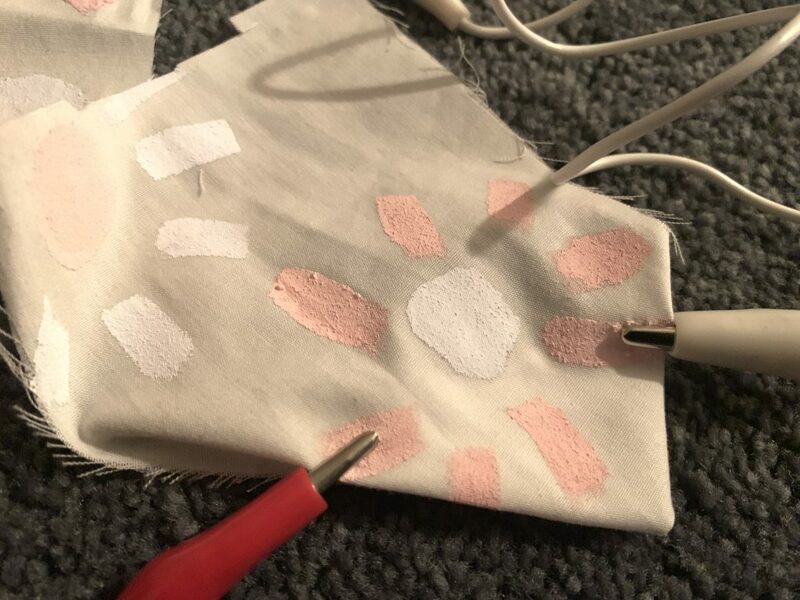 In later iterations I would use conductive thread and sew the flora onto either a blanket or sleep mask with a portable battery set. 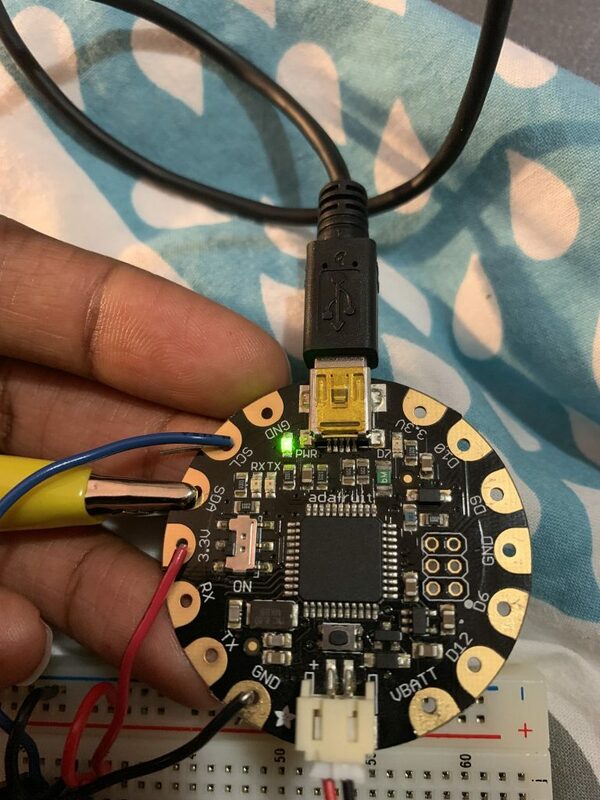 Perhaps multiple vibration sensors weaved and sandwiched within a blanket or the mask that meet the right spots could mimic the sensation of gentle nudging to help awake one from their sleep. For this workshop I played and experimented the Eeonyx stretch sensing fabric to send messages to processing and activate certain commands. 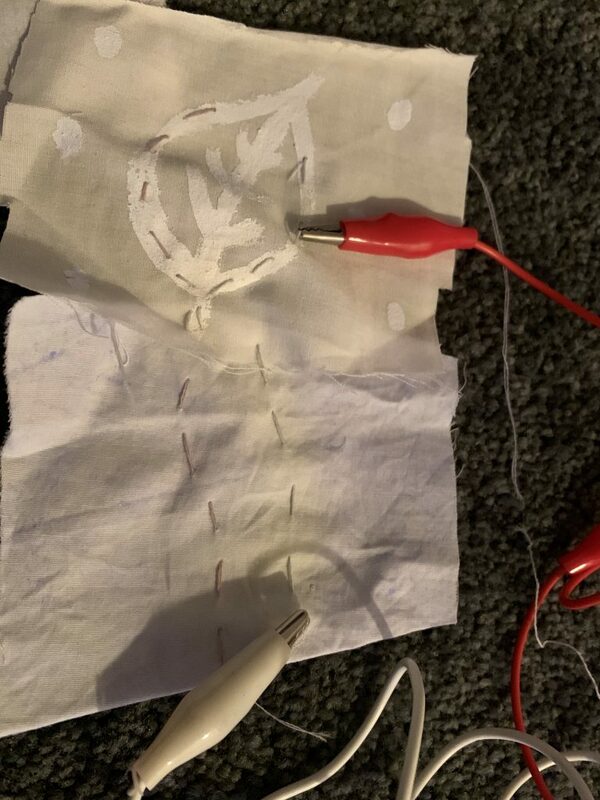 I wanted to create switch operations when the fabric was stretched out or not. Figure 1. Eeonyx Stretch Sensor. Originally, I was going to experiment with the Eeonyx StaTex Conductive Fibre and create a visualization of rain. When the conductive fabric was squeezed the rain would appear in the sketch. Holding something grey and soft like fibre reminded me of a rain cloud so I thought I’d try this idea. However I lacked materials and time so I went with the stretchy fabric route and would attempt the former later. Figure 3. 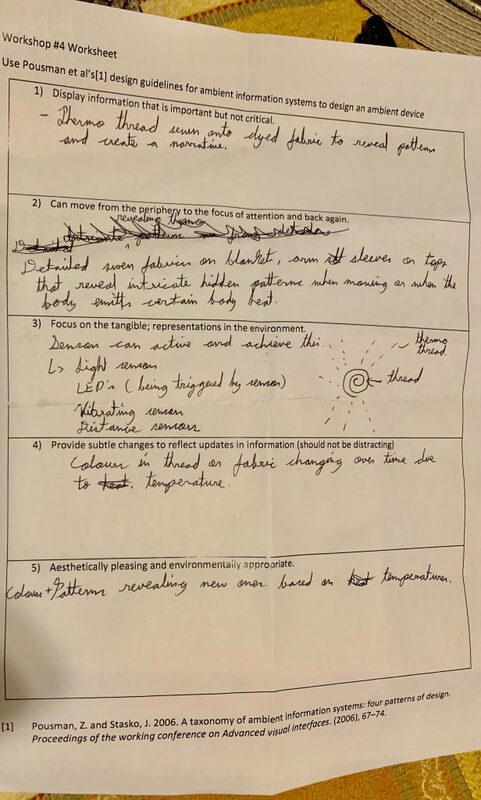 Workshop 2 notes. Figure 4. Workshop 2 notes. 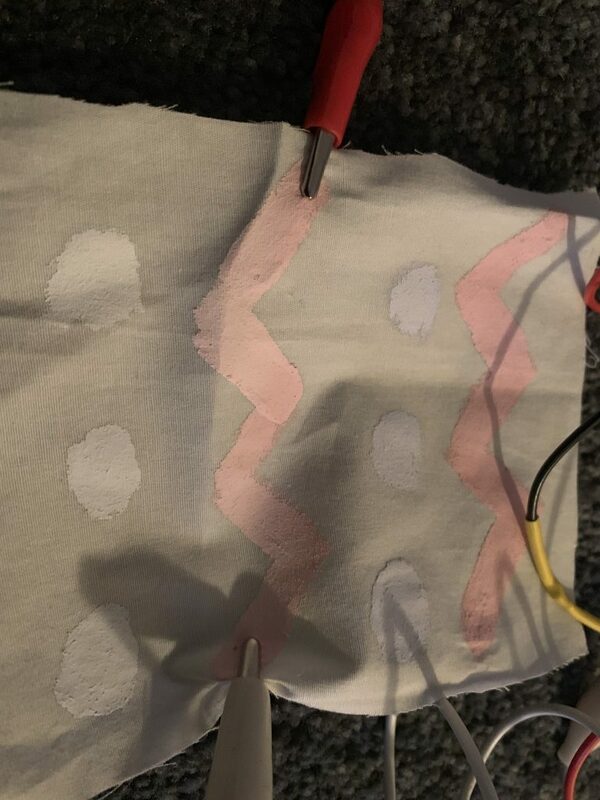 I used the AnalogOutSerial code from Arduino to get the values from the stretchy fabric. 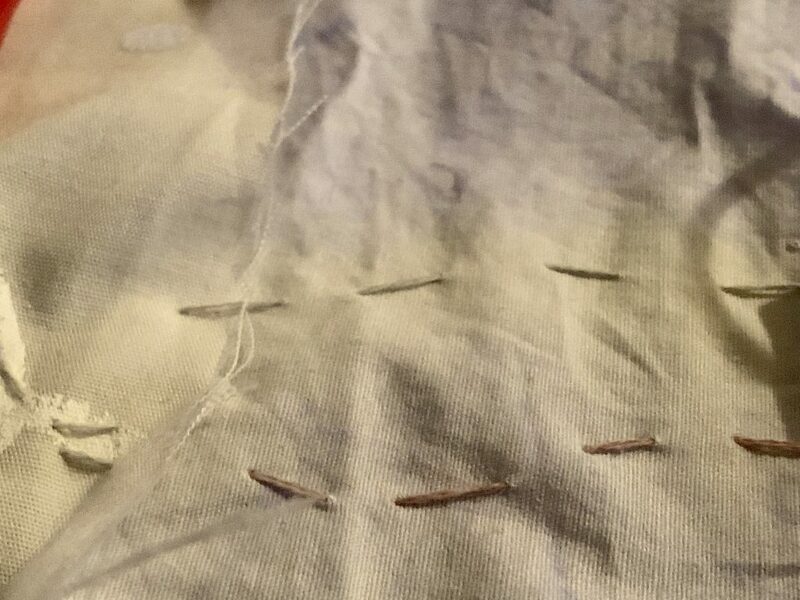 Whenever I stretched the fabric its resistance would change by one number. I wanted to translate this data to a processing sketch and change the background when the number changes. Unfortunately this idea was much more difficult to execute then I realized. The sensor was really finicky and caused the background to flash when I stretched my sensor. I tried this again with the touch pad sensor. The values were much more responsive when I touched it but I got the same finicky problem in Processing. I also notice the change of resistance value would never be the same number when I closed the processing sketch. 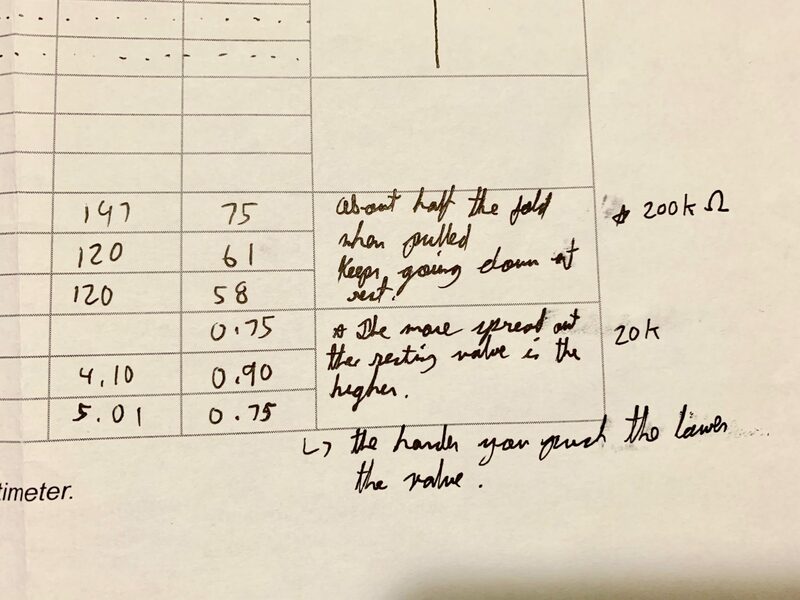 Sometimes it would go below or jump to a high number so my if statements would not work and I would have to change the numbers. 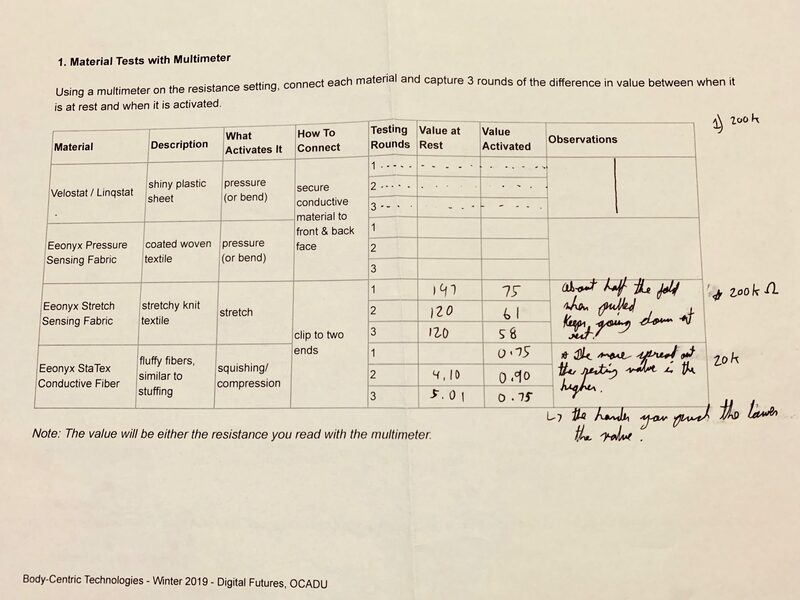 Wether I had used the wrong code or was not filtering the data properly to get an on/of digital affect with analog data, I wish to explore the resistance of change with fabrics further and possibly create other scenarios and prototypes. 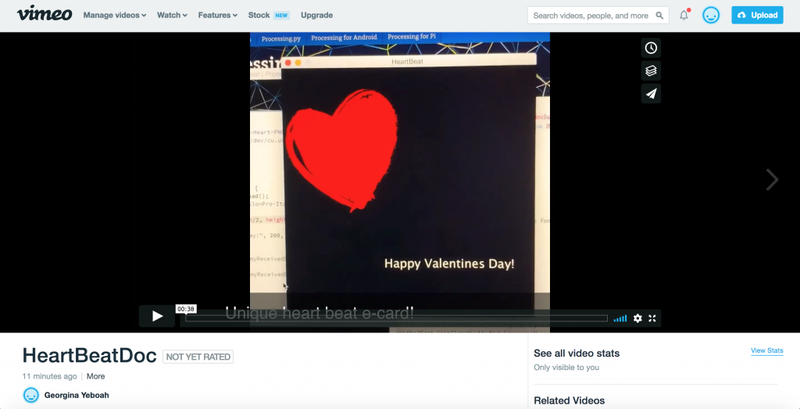 My explorations with the heart pulse sensor lead me to creating a low-fidelity prototype of e-cards! Figure 1. Processing Sketch E-card. 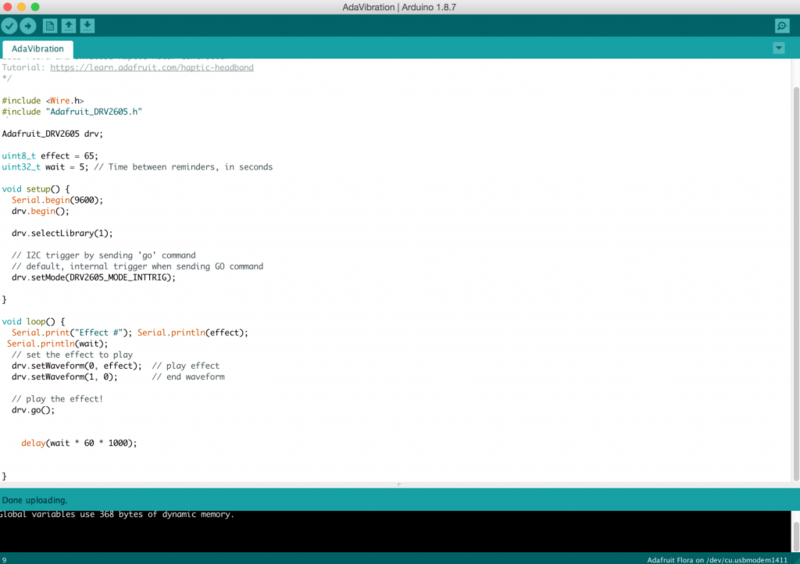 I wanted to explore data transferring between both the Arduino IDE software and Processing using the pulse sensor. 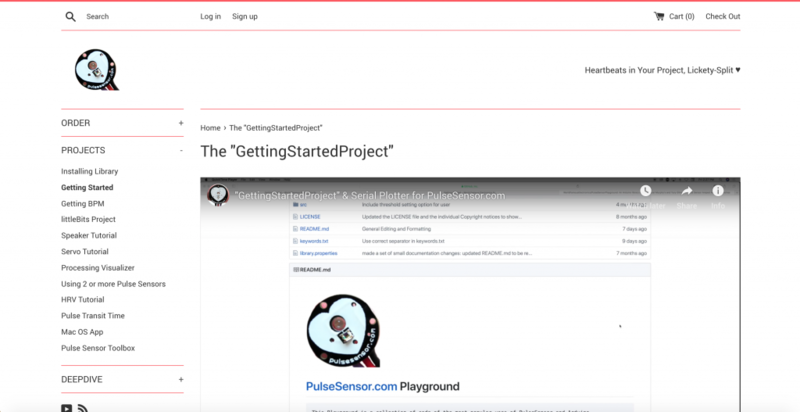 The idea of using pulse sensory data to create an intimate and personal interaction sparked my interest in how I could create this sweet savoury like project/prototype. Figure 2. Progress map of what to do with the pulse sensor. 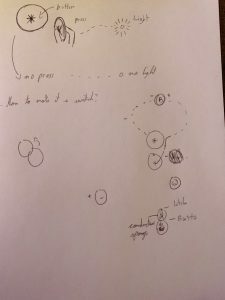 I sketched out what I wanted to do step by step on paper. 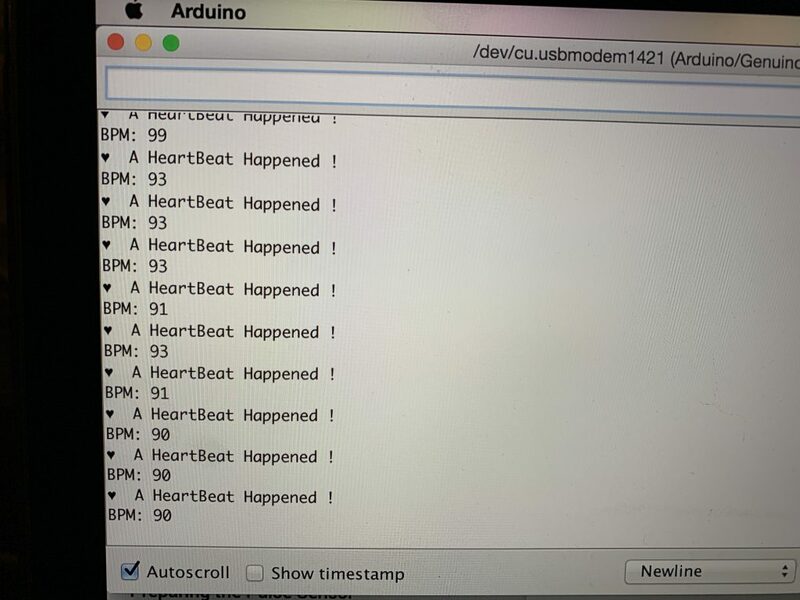 First, I was going to setup and play around with the pulse sensor in Arduino to see how it worked and how the examples provided in the playground sensor library was tracking my heart rate. 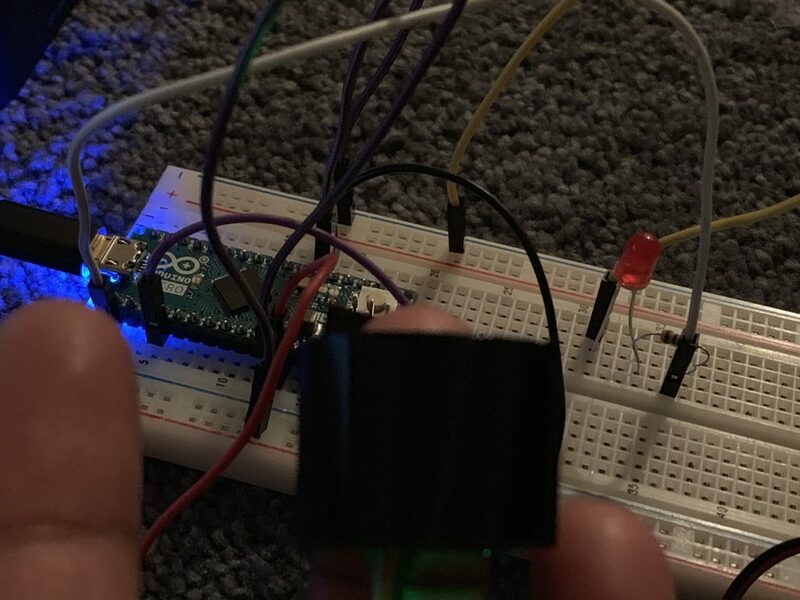 I followed the instructions from the pulse sensor’s website to help me set up. 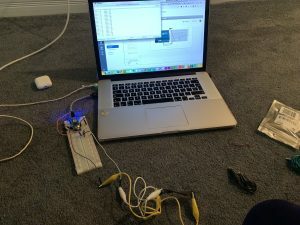 I was able to successfully set up the pulse sensor and started playing around with the example sketches in the Arduino IDE. 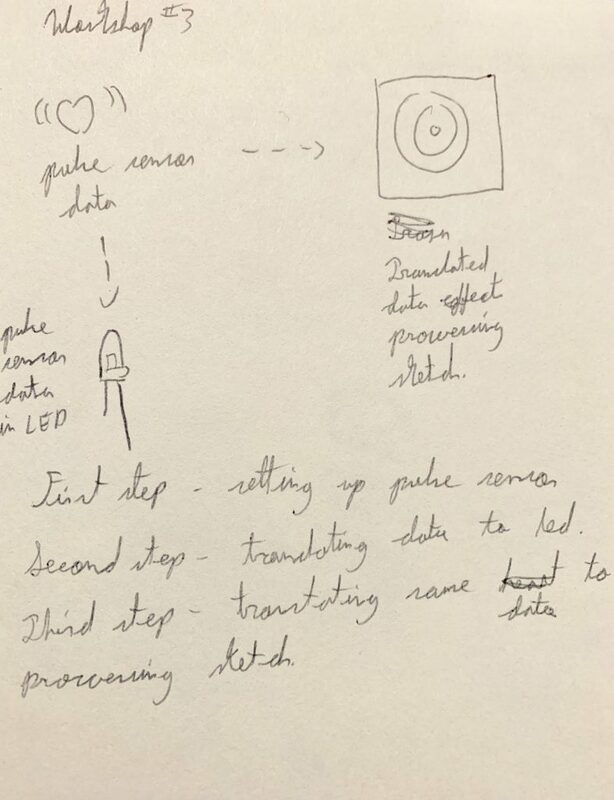 Figure x. Fritz diagram of led and pulse heart sensor (off screen). Figure 8. 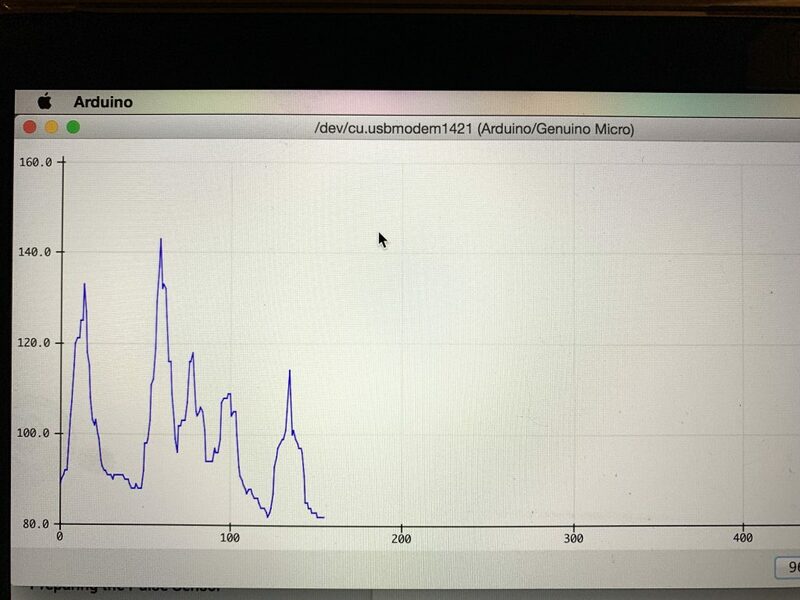 Pulse sensor data on plot monitor on Arduino. Figure 9. 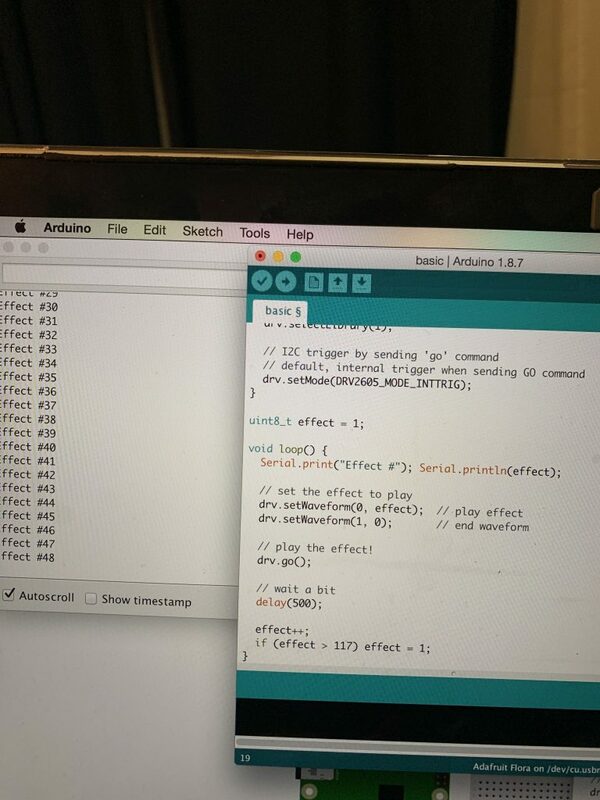 Pulse sensor data on serial monitor on Arduino. 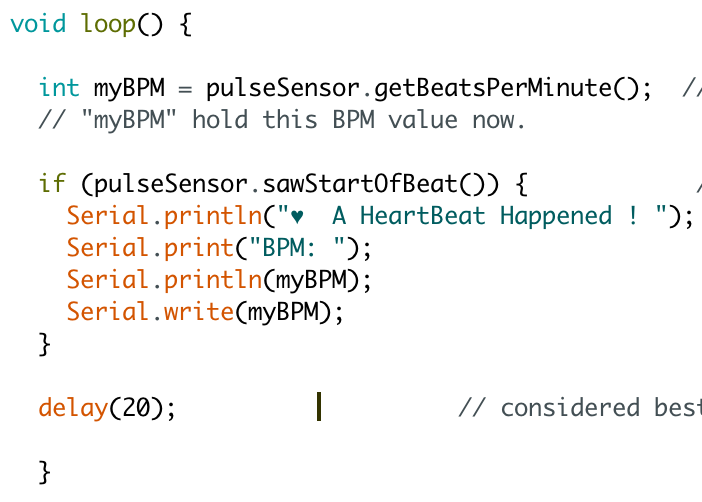 This setup and serial data is from the PulseSensor_BPM code in the pulse playground library. 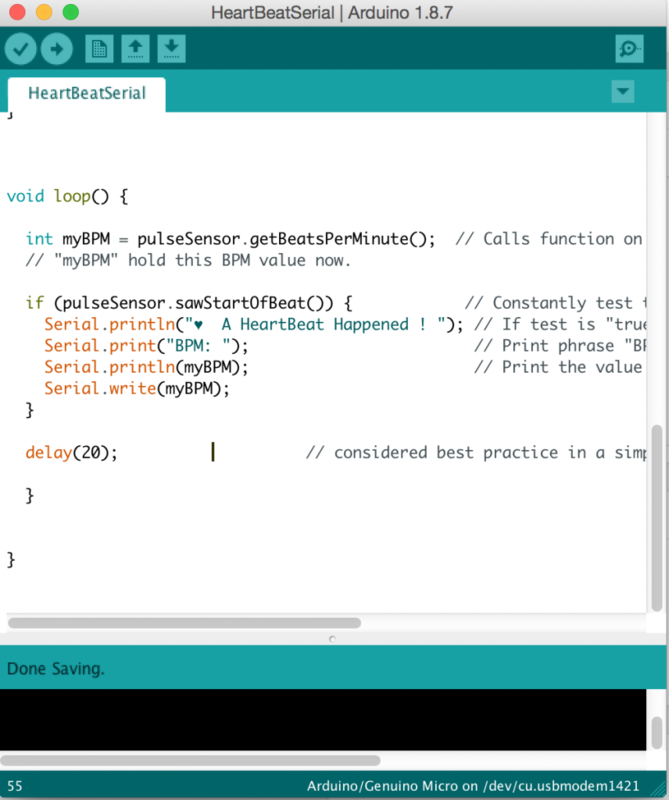 I made a new file called Heart Beat and added the syntax line “Serial.write(myBPM)” to send the data over to processing. Figure 10. Sending the data through “myBPM” variable. Figure 11. Sending the data through “myBPM” variable. 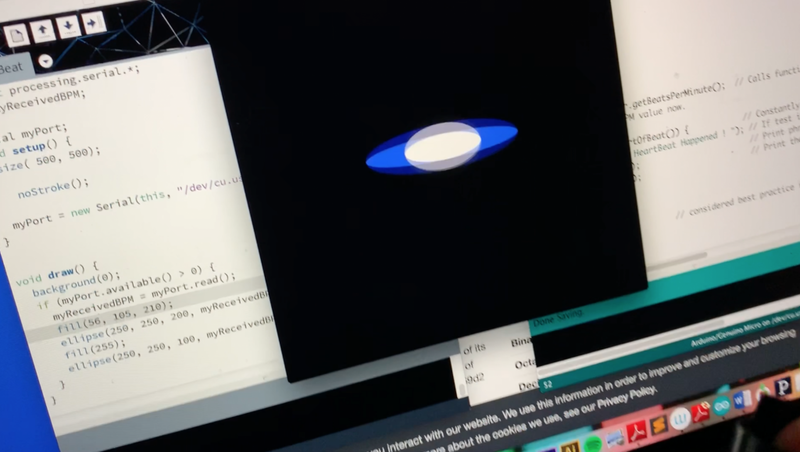 I then sent this data over to a processing sketch, opened the port and placed the incoming data in an ellipse’s properties to manipulate its shape. Figure 12. 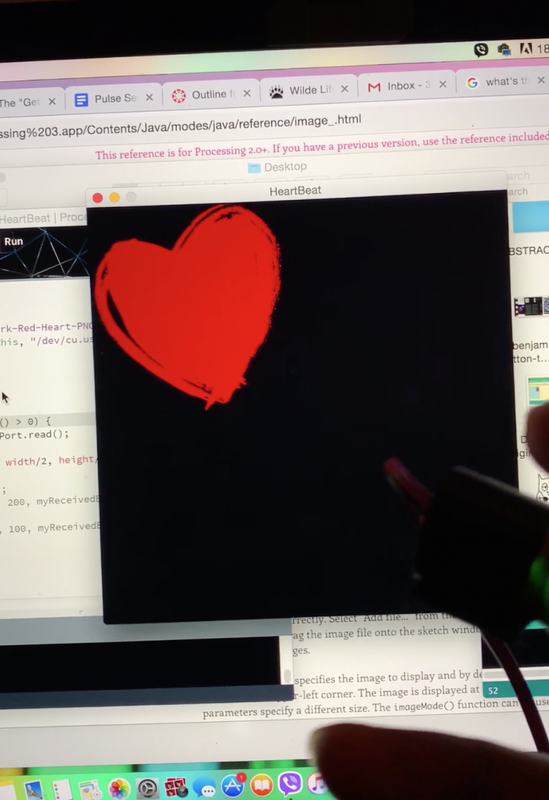 Sending the data to processing and changing the width of my ellipse by the pulse sensor data. Figure 13. 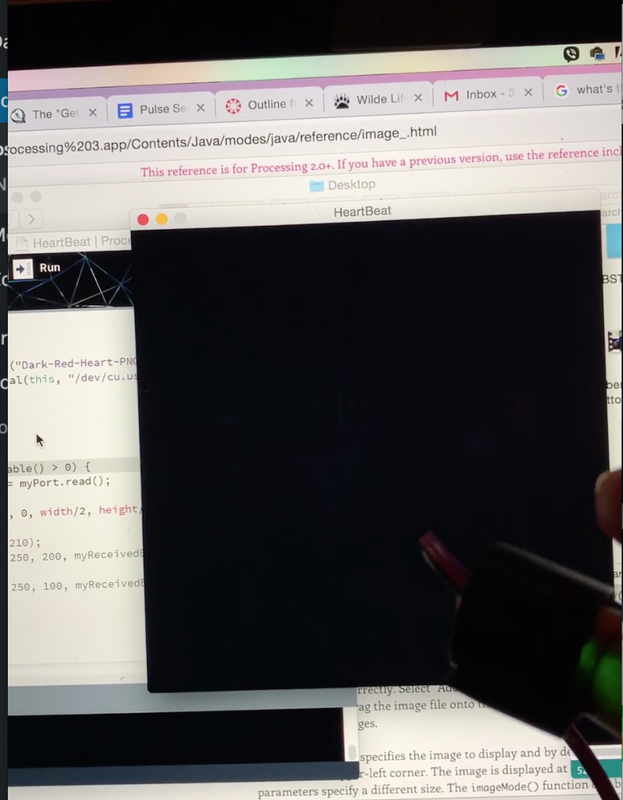 Using the data to control the appearance of a heart image. Figure 14. 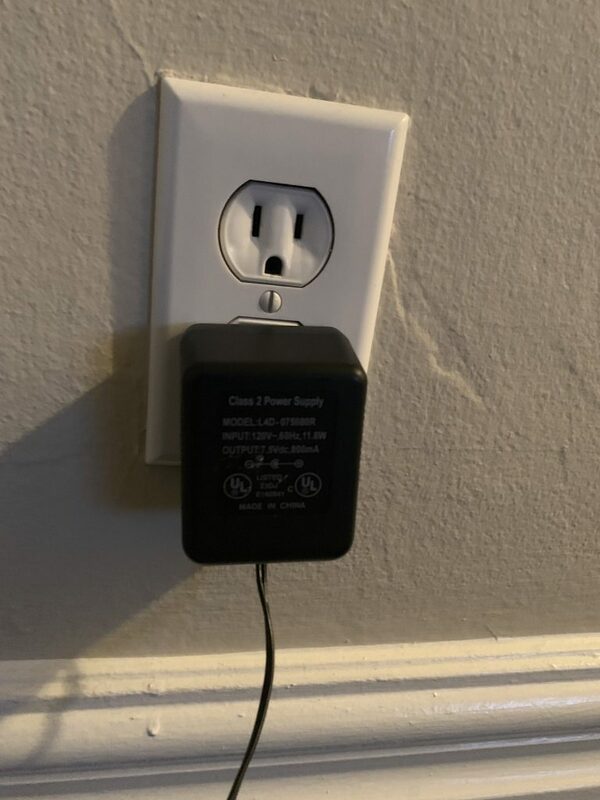 Heart image shows up when the sensor detects a pulse. My incoming BPM would cause the image to appear on the screen every time the sensor read my heart beat. 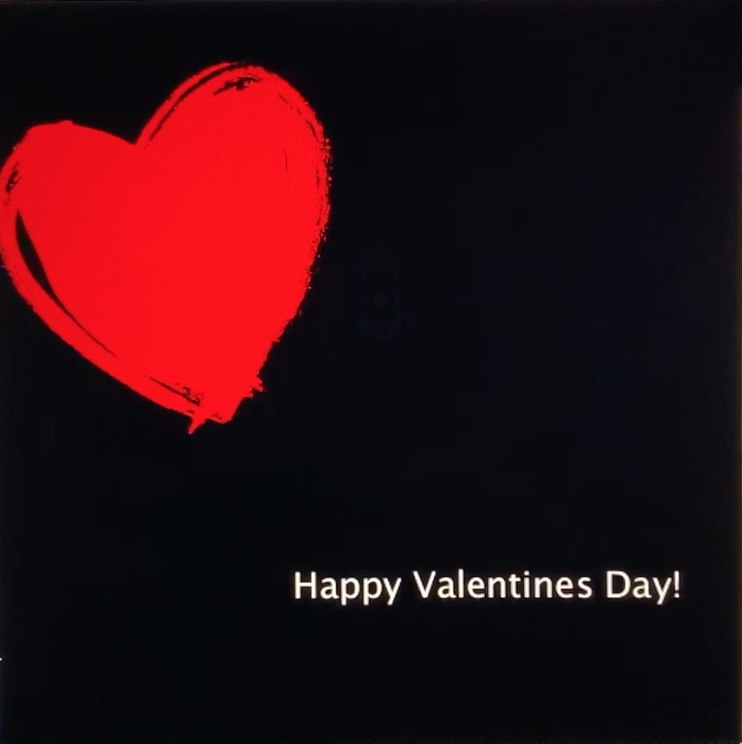 I later had some fun and thought this would be a cute valentine e-card. Figure 15. Pulse sensor e-card prototype! For future works I’d like to take this sort of concept online so long distant lovers could send over in-real time e-cards of their partner’s heart beats. This could also be implemented in webcam calls or on common online canvases. Checkout the process video below! 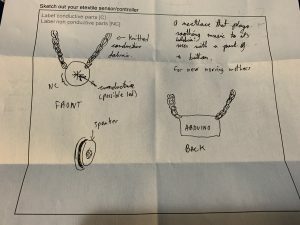 Strategy: I set out to create a soothing melody necklace that plays a lullaby when you push the pendant. Originally I had planned this for ttc commuters but commuters usually use earphones, reading or other ways to separate themselves from the chaos around them when it comes to transit. Therefore, after the mix and mingle word exercise I thought why not make a necklace that soothes the soul and those around them. 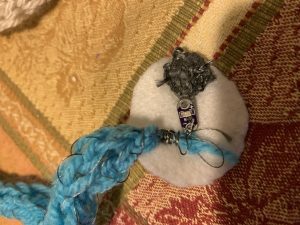 Why not make a soothing lullaby necklace? This wearable would be great for new moms and their newborns when trying to get them to sleep putting both parties at ease. 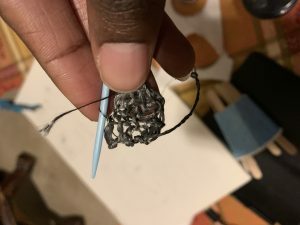 For first initial steps, I used the french knitting technique followed by the conductive button approach. 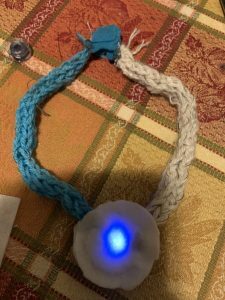 The front part of the necklace’s medallion would act as a trigger, so when closed the necklace would lit up and play a lullaby through the speaker. 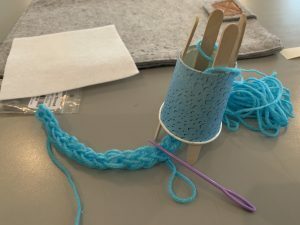 French Knitting for the first time! 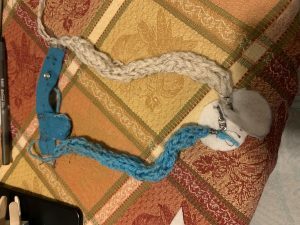 Two french knitted conductive chains. The white chain is connected to a button that connects to the other side of the LED. Then I decided to just test my circuit on the left with an LED using a push button technique. 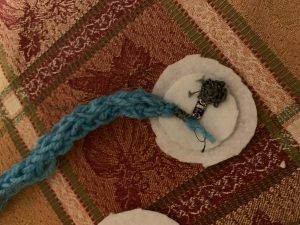 I knitted my button with just conductive thread. 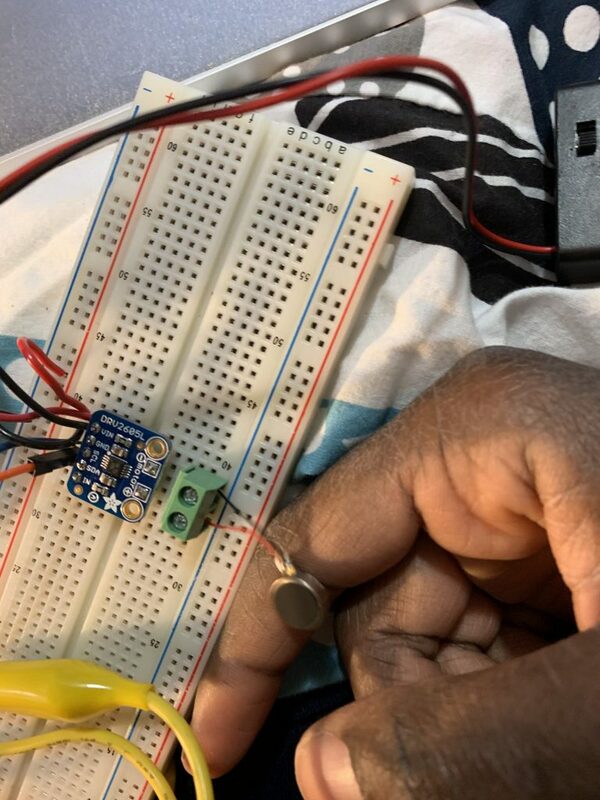 The conductive button technique wasn’t working for me because my circuit based on the picture above, I was clearly connecting my negative (blue french knit chain), with the power side of my power bracelet. However even though that was the case, the design at this stage was messy and I didn’t like it. 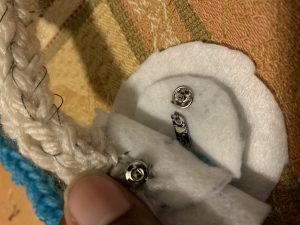 So I retreated to using the button technique with just the button clips to complete the circuit. 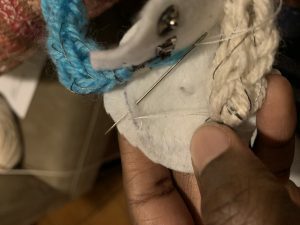 The knit conductive button has been replaced with just a sew on button. Information sources: I didn’t use any external sources other than the tutorials given in class. I’d like to try out other techniques and see where exciting outputs I can make or conduct with this. 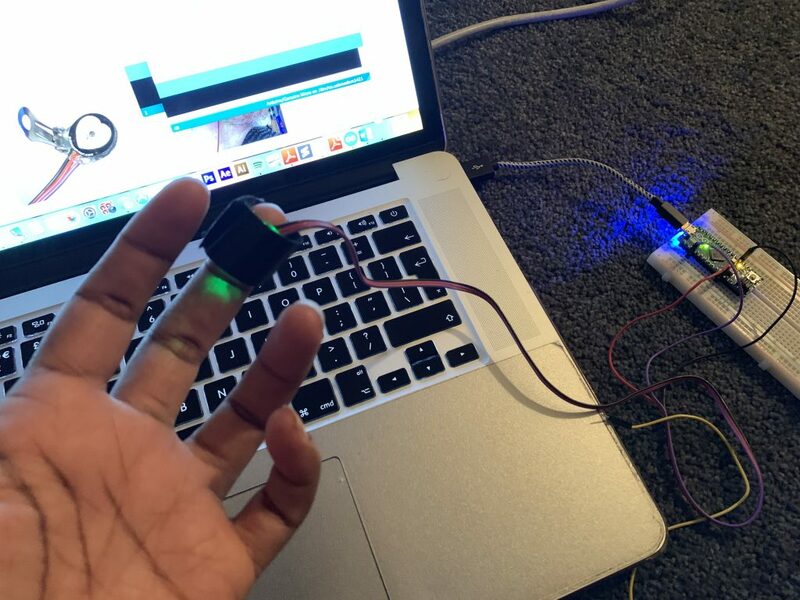 Making a pinch sensor for the fingers that activates the light when it touches the medallion could be a next step I’d like to explore. I would try and make this much neater incorporate actual sound in the next phase.